Crohnoid - an IBD Journal: Crohn's Disease - DIARY - Starting 2015 as we mean to go on..
Crohn's Disease - DIARY - Starting 2015 as we mean to go on..
Thursday 15th January 2015 - St.Thomas' - the first appointment of the year. Not one I had been expecting until the letter came through the post. I was in half-a-mind to cancel. It was the follow-up to seeing the dietician in October 2013 to talk through the benefit of low FODMAPs. Since our last meeting I had a new diagnosis to contend with - Bile Acid Malabsorption. We spent about 40 minutes discussing many different aspects of diet. She recommended that I try and increase the amount and variety of fruit and vegetables in my diet. She also suggested taking multi-vitamins each day as the loss of my terminal ileum would mean not absorbing them properly from normal food. I seem to be unable to get my BMI out of the overweight range (currently 26.1). She told me not to get too hung up by the numbers. Whenever I'm working in London, generally three days a week, I try and walk at least 10km during the day. I'm trying to achieve the balance between keeping fit and keeping the weight on, which may sound a little odd. My gastro consultant likes his patients to be on the slightly heavier side in case there is the sudden need to undergo an operation. (I lost around 5kg after my last one). I want to keep fit for the same reason. As you get older the recovery process takes longer so the fitter you are at the start, the better. Tuesday 27th January 2015 - St.Thomas' - first gastro appointment of the year was originally planned for 13th January but I had, stupidly, taken my calprotectin sample into the pathology lab too late. A quick email to my consultant's wonderful secretary and she slipped my appointment back two weeks so the results would be available. I arrived shortly before my allotted time and waited for my name to appear on the "laser display screen". It must have been about 15 minutes before it appeared - "Go to Room 17". When I opened the door one of the registrars greeted me and introduced herself. I didn't stand on ceremony. I explained that I really wanted to see my usual consultant, for continuity's sake, and was prepared to wait accordingly. She was fine with that. Back to the waiting area. Before now I've had to wait anything up to another hour but this time it was only ten minutes - "Go to Room 18". When I entered the room my consultant had two other doctors sitting in with him, one visiting from Greece; the other a junior doctor working within the department. 3) Do I need a colonoscopy? Yes. Given the elevated calprotectin level the only way of checking for inflammation was to go in with the camera. I noted that, thankfully St.Thomas' use Citrafleet which only requires drinking 300ml of liquid and a small bottle of senna. The thought of drinking 4 litres of Klean Prep, as used by some other hospitals (and in Greece BTW), filled me with dread. Request typed into computer with note about Citrafleet. Just need to wait for appointment to come through. My consultant would be driving the camera. 4) I mentioned that over the Christmas period I had felt really rough - lower back pain extending down the backs of my legs; and ache around my midriff and very tired. As always with Crohn's it was difficult to know if it was the Crohn's itself, a virus I had picked up or overdoing sweeping up leaves. 6) I ran through my discussion with the dietician - see above. 7) More an observation really - I am very surprised that two capsules of Loperamide are controlling the Bile Acid Malabsorption and that I currently don't need to take Questran or similar. 8) My other observation was the lack of discussion (as far as I can see) of BAM given the prevalence in patients after ileal resection. I felt that it really should have wider coverage and that the SeHCAT test should be routine given the severe diarrhea it can cause and that the symptoms may appear to be the Crohn's itself and get treated as such. I quoted the NICE statistic that I had found. 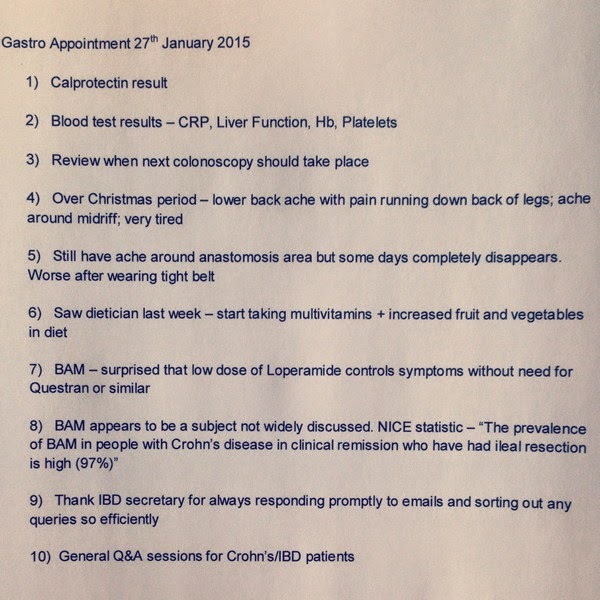 10) I wondered if the Gastro department ever held open Q and A sessions that enabled patients to come along ask general questions about Crohn's/IBD to increase their own understanding of the disease. He replied "not at present" but they had been discussing ways of engaging better with their patient base. He would pass my name onto the person charged with the task. I explained that I'm getting to the stage where I would like to give up work and devote some time to helping the Crohn's community although I felt I knew very little about Crohn's and in the grand scheme of things had escaped very lightly compared to those who had had 20+ operations. He felt I was doing myself a dis-service. And that was it. Follow-up appointment for six months time but, as he pointed out, the next time he saw me would be from the wrong end of an endoscope. His "list" had now been moved to the new Endoscopy Suite at St.Thomas' which pleased him as the equipment was better than his old clinic. I walked back to Victoria Station somewhat disappointed. I had hoped the calprotectin level was still around 50. If the colonoscopy does show that the inflammation is returning the next question will be how to deal with it. We know Azathioprine isn't an option. Next planned appointment - Haematology at Guy's - 11th February 2015....or will the colonoscopy come along first?